The Villages Recreation Department welcomes you to a world of fun, friendships and learning! Our team of recreation specialists and volunteers are here to help you explore the variety of services and facilities we offer to enhance your active lifestyle in Florida's Friendliest Hometown. Please, always carry your Villages ID/Guest ID and follow all posted rules and regulations in your activity location - including all posted age requirements at all centers. Prior to getting involved in your recreational program, be sure to consult a physician to ensure you are ready to participate if your interests include strenuous activities. Please be sure to fill out the activity release at your recreation center before joining in the fun and always wear appropriate attire while at the recreation center. Participation in recreational activities always involves some degree of risk. Participants assume full responsibility for and risk of bodily injury arising out of or in any way connected with participation or involvement in or presence at the activity or program. Play and swim at your own risk. The Villages District Recreation Department has earned national accreditation for excellence in operation, high quality services and experiences by the Commission for Accreditation of Park and Recreation Agencies (CAPRA). Our Recreation Department is committed to providing productive and enriching leisure time pursuits, extraordinary services and experiences to residents of The Villages through our core values; hard work, hospitality, stewardship, and creativity. Our dedicated staff is proud and passionate about all our recreational opportunities. We encourage residents to volunteer and get involved in creating a healthy and active lifestyle in their hometown - The Villages. Currently, the Villages Recreation Department services 34 recreation centers, 80 swimming pools, 2,500 resident lifestyle programs and clubs with a full and part-time staff of over 500 employees and over 2,000 volunteers. We always welcome comments and suggestions for expanding and enhancing The Villages recreation opportunities. John B. Rohan has worked for The Villages Community Development District since 1993. John’s leadership extends to several areas within the recreation department that include Executive Golf, Fitness Clubs, Special Events and Room Reservations. These facilities are managed with a budget of $20 million per year and over 500 full and part time employees. He has witnessed and experienced firsthand the positive impact recreation has had on the residents of our community. Through his experience in recreation management, recreational programming, and special event management, John encourages resident’s involvement in creating a healthy and active lifestyle in the community. John received his Bachelor’s degree in Recreation from the University of Florida in 1993 and his Master’s Degree in Public Administration from Troy State University in 2002. He is an active supporter and member of the Florida Recreation & Park Association and the National Recreation & Park Association. 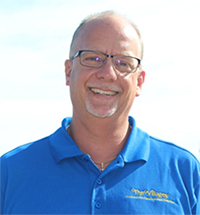 John serves on the Children’s Advocacy Center Board, Operation Homebound, St. Timothy’s Pastoral council, Knights of Columbus and highly involved in The Villages Charter School. He and his wife, Krissy Rohan, Director of the Little Buffalo Learning Center enjoy the outdoors and spending time with their children, John Michael and Chelsea who are both attending college in Gainesville, FL.